Who Drew the Rooster on the Sriracha Bottle? The logo on our favorite "rooster sauce," and its fascinating history. With the booming Sriracha cultural obsession, the rooster is now a tongue-in-cheek enhancement for dozens of everyday items like water bottles, iphone cases and cycling socks. The genesis of this iconic image took place back in the ’70s, on the streets of a war-ridden Vietnam. David Tran, Vietnam native and founder of Huy Fong Foods, stumbled upon a street artist. Tran asked for a drawing of a rooster, and the rest was history. When Tran began making his original chili pepper sauce, pepper sate, a tiny version of the sketch was used to label the caps of his bottles. Then in April of 1975, with Vietnam in shambles, Tran fled for Hong Kong, then to Boston and finally to Los Angeles, with dreams of expanding his business. Of course, he carried this sketch of the rooster with him all along the way. Some time after arriving to the states, he commissioned a Chinatown artist to re-draw the original bird ”“ he wanted a larger and sharper image of the rooster for his bottles, which he started manufacturing in California in 1980. His choice of a rooster wasn’t simply a matter of preference. The rooster is Tran’s Chinese Zodiac symbol ”“ a 12-month astrological chart that aligns an animal with each year and assigns traits based on them. 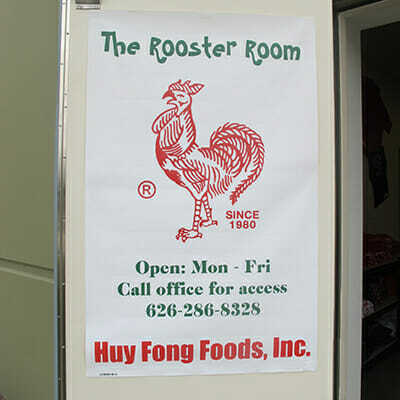 The entrance to Huy Fong Foods' gift shop: The Rooster Room. 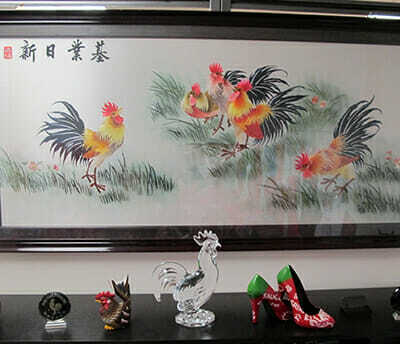 The room contains rooster statues, sriracha high heels and everything else rooster. 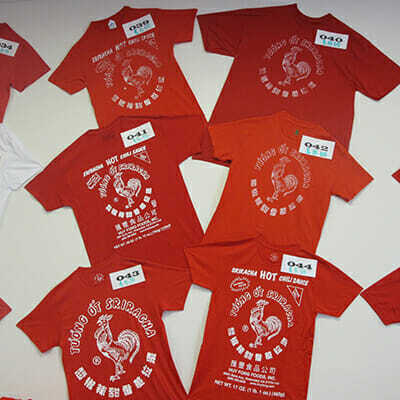 Sriracha tee shirts for sale in The Rooster Room. Founder and owner of Huy Fong Foods, David Tran. The rooster is also a symbol of strength, Tran adds. Roosters are often used in Vietnam to fight against each other. Even when they’re struggling to stay alive, they’ll still keep fighting. Sadly, some time after arriving in the States, his original rooster sketch was lost. Though perhaps keeping the original picture may not matter that much. 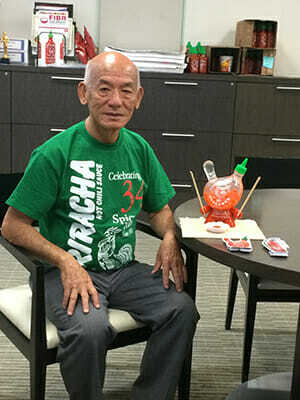 Today, “rooster sauce” is the most common nickname for his Sriracha. Ed. 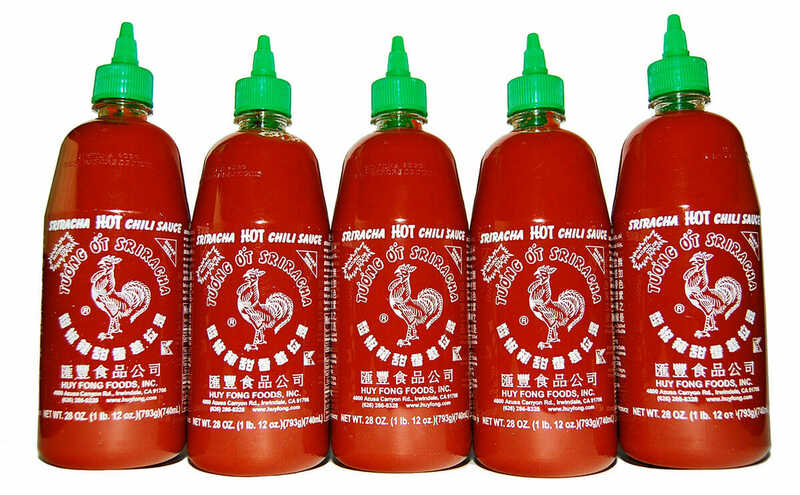 Note: An original version of this story said Tran manufactured Sriracha in Irwindale, California, in 1980. His Irwindale factory opened in 2013.